I am having some minor issues (I apologize for the Cyanobacteria bloom), but I figured I might as well put up my latest project, as I have been promising a few people I would. 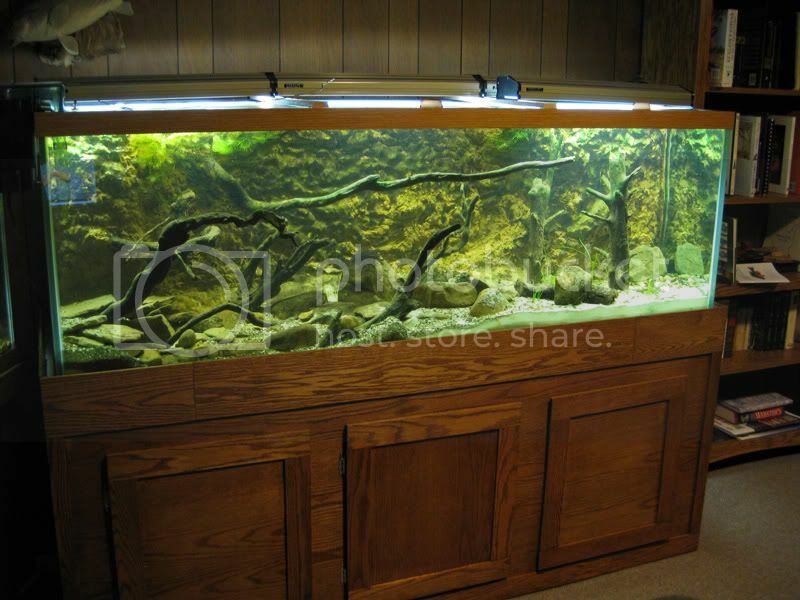 The pet store down the street from me was changing ownership and I was able to get a pretty good deal on this 180-gallon aquarium. It sat in the garage for MONTHS as I learned how to build the stand (still a little scary that I built it, but no guts no glory). I then worked on the background which was very similar to how I built my 75-gallon: lots of Styrofoam, Great Stuff, silicon and sand. I also made something similar to an overflow box in each back corner of the tank to hide the plumbing. The water goes into a hole in the bottom and top of the right side (you can sort of see the bottom hole in the side view) and flows up and over a little wall so I can fill it with filter media. The water then flows through a Plexiglass channel to the left side where there are two pumps that have tubes to create a very strong riffle. I also have a HOB filter on the right side of the intake will also be behind the background (just havent gotten there yet) and once I move my fish I will add my canister filter. Enough with the chit chat here are some pictures. 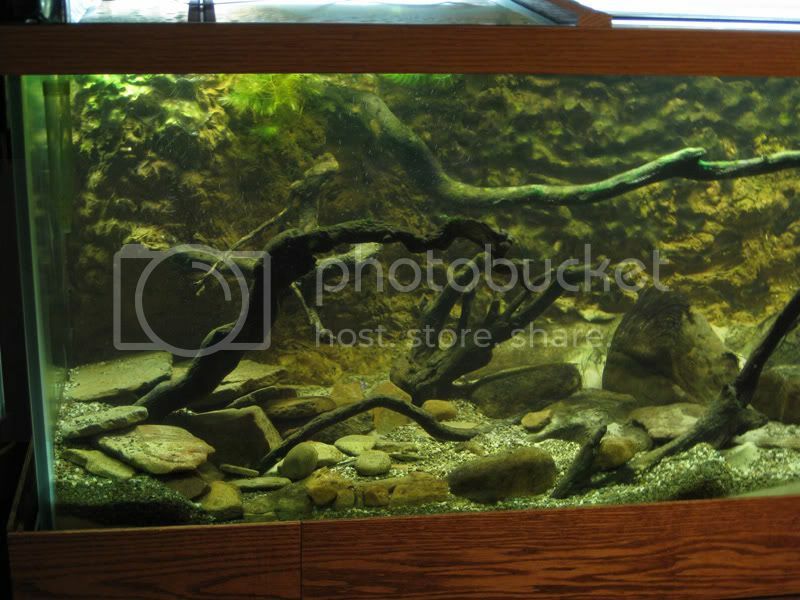 Here is a dead on view of the tank. Slightly angled view of the tank. You can see in the above two pictures that there is LOTS of driftwood in the tank, some of which I built directly into the background. The left side is rocky and will be my high current riffle area. After hitting the middle of the tank with the large boulders the current breaks up and enters the planted section (that Todd Crail dude had a very cool design idea). I collected a bunch of vallisineria in October and it all died but eventually started regrowing. In the last 3 weeks or so a few of the plants really started taking off and I am hoping they grow in very thick, very soon. My biggest plants, the tallest about 1 high. Close up of the left side. You can somewhat see where the long driftwood attaches to the background I am growing a clump of hornwort  a mixture of a large, bright green local strain (I have had for a long time now) and some I bought in a pet store. The rock pile against the glass hides the tubing coming form the poswerheads for the current. Close up of the hopefully soon to be planted right side. 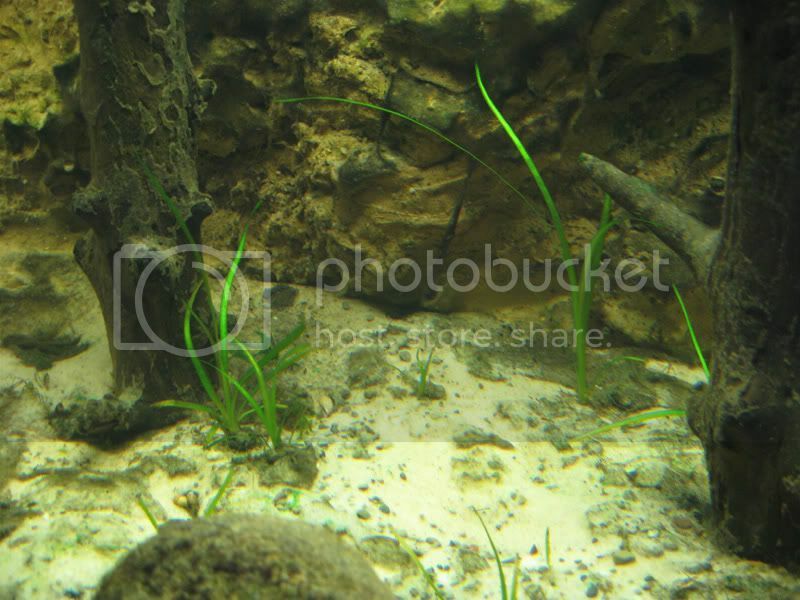 In the upper corner, about 1 from the end, I am growing an aquatic moss I found in a stream. Love this stuff but it is very hard to see in the picture. The rock leaning aagainst the background hides the hole for the water intake. Here you can somewhat see the way the plumbing works and a section of my book shelf. Here is where the majority of my hobbies are confined. 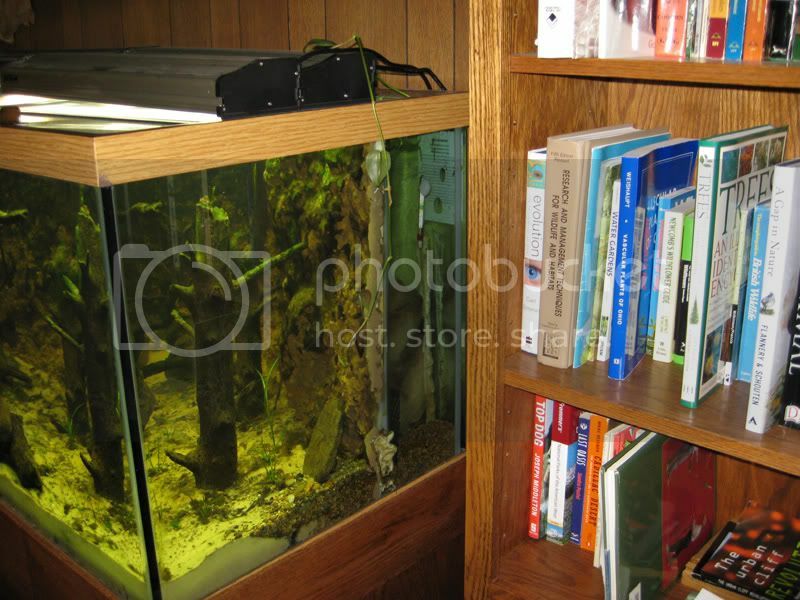 In the picture the back aquarium is the 75-gallon and all the fish, which are native Ohio minnows, darters, etc, will be moved to the 180 once the plants grow in a little more, the snail population takes off and hopefully I can get some blackworms and scuds established in the filter area of the tank. 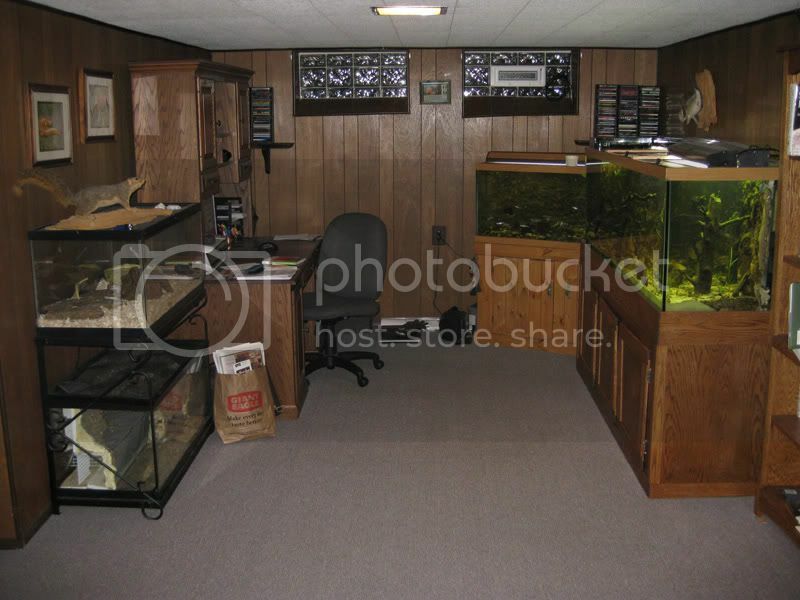 The two 40-gallons on the left hold my 18 year old California Kingsnake and the bottom tank is empty. P.S. The squirrel is not alive (anymore). Edited by andyavram, 11 December 2009 - 10:29 AM. I love the background. I have experimented with building one or two backgrounds for a couple small ten gallons I have and they are no where near the work you have done. Your work is awesome. Looks fabulous! I love your tube-hiding rock pile. I had a similar problem with val when I moved it from a tropical tank to my river tank. I wonder if it has to do with temperature changes? Looking forward to seeing how it all looks in a couple more months! 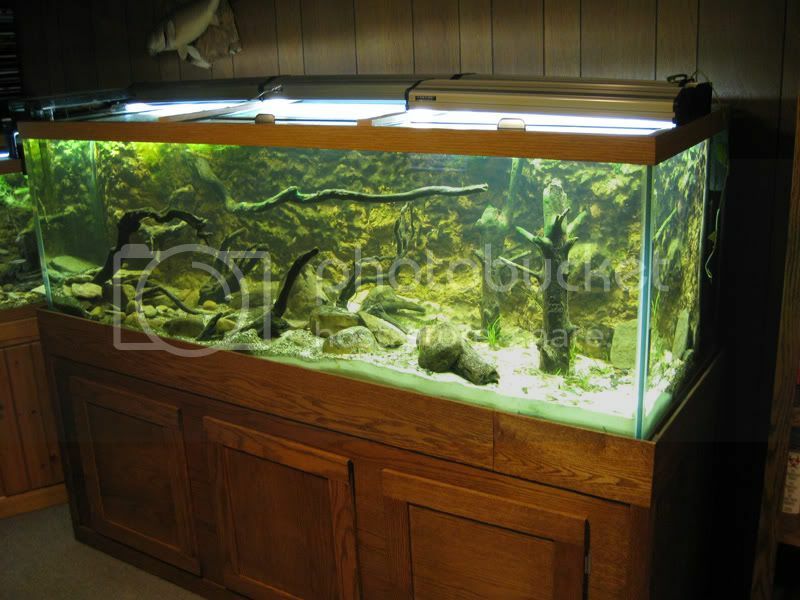 Awesome tank - great addition to a really cool room. I'm very jealous. Would love a squirrel like that for my office! Looks great Andy! I will be working on something very similar this winter break for an Alabama-themed tank. I look forward to the progress of your project! Wow. Great tank. Great "Man Cave" too. Great tank! I'll be interested to see what you stock it with. Nice job! Glad you all enjoyed the tank. 3Gold, I hate seeing plumbing of any sort (hence the whole background) so I always try and find a way to hide it naturally. I pulled the Val out of a ~55 degree river in October and then it went to my tank. Maybe why it melted originally. I would like to increase the individuals of some of the species and get a handful of other species. How is the cleaning of the background? I have yet to clean my concrete background, but I would think that it would harder to clean the sand that's attached. cjones, they are a little scary, but fun. I recommend reading up, gather your ideas and jump right in. I have built a few at this point and love 'em. jblaylock, why are you cleaning it? My 75-gallon background has been operational for over a year and I have never cleaned it. Both tanks had (180 still has) a cyanobacteria outbreak but I just siphon it off, once my plants grew in on the 75 the CB went away, still waiting for the 180 plants to grow in. The background does grow algae, like the stuff that grows on the rocks, but I like the look. For the 2 backgrounds I have done I have tried to simulate the rock ledges that is commonly found here in central KY due to the limestone bases. I ended up going with the standard gray concrete color. I am growing some algae on it now and it's turning the concrete green and it's much more noticeable. I need to post some pics of mine. I am planning a 125 gallon setup and I would like to do a background for it. I like the look of yours much better than the ones found on the net that use concrete. You should have done a detailed 'step-by-step' process for building it. Anyways, awesome tank, love it. Excellent set-up! 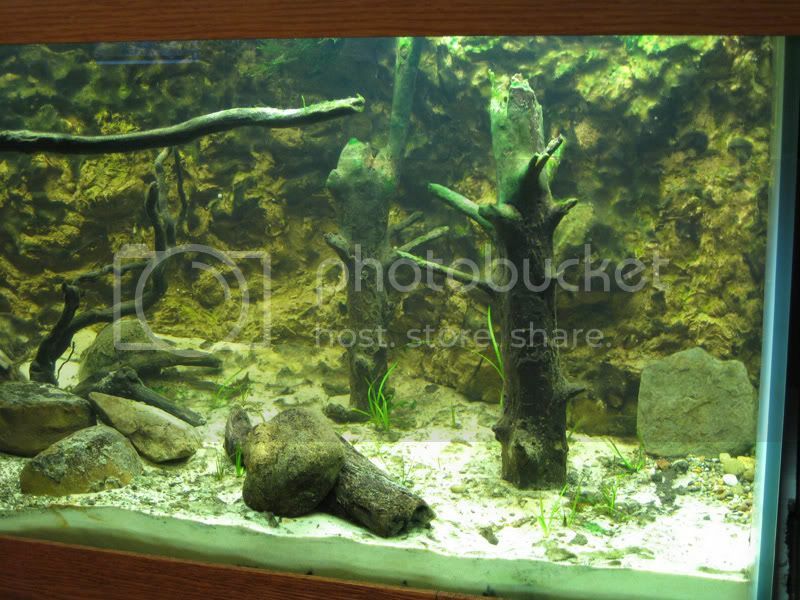 I'm truly jealous of the driftwood on the far right side of the tank. I've always got my eye out for interesting aquarium ornaments when I'm out in the field, but I've never come across a piece of driftwood quite like the one you've got. Also, the styrofoam background is fantastic. Truthfully, I've never seen one that I don't like. Let me know if you want to do some collecting when things warm up again. We can surely increase the stock of that tank...plus, it looks like I need new Ghost Shiners because the Orangespotted Sunfish that looked innocent enough has trimmed my population from 30 to 1. Jblaylock, I can probably write-up a short how-to. It is very easy and I have one or two pictures of the process from the 75. I really should have taken more of the 180 along the way. Nate, glad you liked it. I work for a park district and we have a beach on Lake Erie at the mouth of the Grand River. In the spring all the driftwood is a free for all me anyone that is interested in it. Got nice stuff for the yard and the tank. Keep it in mind for any local beaches by you. Actually the wood on the far right was the bottom of the wood right next to it. I just stepped on it to break it in half so they would fit (I hate the look of cut wood in a tank). I am game to get out this spring. I would really like to know how to build a background like this too. Awesome tank! I noticed how you extended the top of the stand! VERY SMART! I can tell you put a lot of thought into the composition, It looks great now and will be spectacular in a month or two. Tell us about the substrate. I've been thinking about building my own stand and canopy for a 125. I haven't found the setup I'm looking for so I may build. Did you use all wood framing for the stand, or is there any steel built into it? Andy, the tank is really awesome. Great work. I'd also like to encourage you to put together a how-to for AC. There is already a how-to background tutorial on Black Jungle. I think Andy will agree that the background is easy to construct, but what separates one background from the next is personal preference (what color silicon, sand, driftwood, etc....). The background part is easy, working out filtration/plumbing issues is tough. I'm in the process of making one now. I might take some step-by-step photos and upload them in the near future. I'm not saying that a AC article wouldn't be great. But some of the post on here and on Black Jungle should get you pointed in the right direction. Edited by blakemarkwell, 24 December 2009 - 01:05 PM. That might be the coolest tank on this forum. Looks like a real stream. Amazing work.